Data center maintenance is an important factor in maintaining your equipment. With proper maintenance, you can prolong its life and reduce overall costs by continuing to use your current equipment. First, you should start by checking the red LED battery on the UPS and seeing whether it is illuminated red. If it is, then the battery needs to be replaced. Replacing batteries is routine data center maintenance. Make sure the UPS is plugged into the wall so it increases battery life or faulty replace battery indicator. Changing the battery is usually a most cost effective option than completely replacing the UPS unit. Start by tilting the top edge of the bottom front cover and unhooking it. Set it aside and remove the door screws and open the door. Make sure you grip the wires and pull to disconnect the batteries from the unit. Remove the foam spacer along with all sets of batteries. Do this carefully because they are heavy. Slide the batteries in and hold down the connector so everything fits. Do not forget to put the foam back, close the door and replace the screws along with the lower front cover. Take the old batteries to a recycling center. Other ways of UPS maintenance is to keep it electrically grounded at all times. You should make sure you do not overload the processes. If it shows any distress, unplug it and check for problems and repair accordingly. Changing the battery is usually the most common maintenance aspect of your UPS because it is the most vulnerable and prone to failure. To make sure it is not telling you to change the battery when it really does not need it, recalibrate the battery sensor a couple times a year. To decrease data center maintenance and battery replacement, you can extend your battery life. To do this, do not expose them to extreme temperatures such as hot, cold or even humidity. To recalibrate the battery, you should deep-discharge and recharge the battery while the unit is in special test mode. Recalibration should also occur when installing new batteries. Be careful not to deep discharge too often because this shortens battery life. Wait for the low battery alarm or indicator before replacing the batteries. It is not recommended to store batteries for a long period of time waiting for replacement because this will also shorten their life. It may be tempting to replace the entire UPS unit when the batteries need to be replaced. Often times a battery failure looks much like other failures within the system. A new battery will not compromise your UPS system. 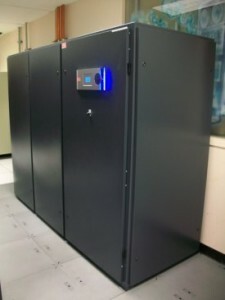 Replacing the batteries is a much more cost effective way of data center maintenance. The other option is to completely replace the unit, but your batteries will still need to be replaced at some point. If you constantly replace your UPS unit when a new battery is sufficient, you will increase your overall costs tremendously. When choosing a replacement battery, do some research to find out which one will be most effective for the unit you are using. Once you start the process of replacing them, read the directions on how to do it correctly and how to prolong its battery life. This entry was posted in computer room maintenance, data center maintenance and tagged computer room maintenance, data center maintenance, UPS maintenance. Bookmark the permalink.